Client applications or systems can also pass credentials to Couchbase Server, by means of x.509 certificates. Administrator usernames and passwords, both required for authentication, are initially established during initialization of Couchbase Server: see Create a Cluster for details. Subsequently, passwords can be changed by means of the password-reset tool, reset-admin-password. For best practices for password-definition, and restrictions on username-design, see Usernames and Passwords. When the Couchbase Web Console is running on the default port, http://localhost:8091, the administrator’s username and password are passed in the clear, from the administrator’s browser to the console. Optionally, Couchbase Web Console can be configured for secure access, at https://localhost:18091; so that the username and password are passed in encrypted form. For information, see Manage Console Access. Couchbase Server-features — including data, settings, and statistics — can be accessed only by users who have been assigned the appropriate privilege. Each privilage is either read or read-write. Privileges are assigned by Full Administrators, in the form of roles. When a user successfully authenticates, their assigned roles are examined, and access is granted or denied by Couchbase Server. See Manage Users and Roles, for details on creating users and user-credentials, and on assigning roles. PLAIN: The client sends the password in unencrypted form. All clients support this authentication-method. It is insecure, providing no defence against passwords being stolen in transmission. Couchbase Server supports the use of x.509 certificates, to authenticate clients. This ensures that only approved users, machines, or endpoints are authenticated. Certificate-based authentication relies on a Certificate Authority (CA) to validate identities and issue certificates. The certificate includes information such as the name of the entity it identifies, an expiration date, the name of the CA that issued the certificate, and the digital signature of the issuing CA. The Full Administrator for Couchbase Server. Internal Components within Couchbase Server that support core functionality (for example, indexing, searching, and replicating), and run with full administrative privileges. Generated Users, which are created by Couchbase Server as part of the upgrade process from pre-5.0 to 5.0 and post-5.0 versions; each in correspondence with a legacy bucket. Each Generated User is assigned a username that is identical to the bucket-name; and either a password that is identical to the bucket’s pre-5.0 password, or no password, if the bucket did not feature a password. Generated Users are created to ensure that legacy applications can continue to access legacy buckets after upgrade to 5.0 or post-5.0, with the same username-password combination being used for authentication. Locally Defined Users, which are explicitly created by a Couchbase Server administrator; and each feature a username and password unique within the Local domain. External: Contains users defined externally; either by means of LDAP or PAM. Passwords are defined and stored remotely. Note that External usernames do not clash with Local usernames. When a user attempts to authenticate, Couchbase Server always looks up their credentials in the same order: which is Local first, and External second. External authentication can be performed by means either of LDAP or PAM. Couchbase administrators can be set up to authenticate by means of LDAP. This requires that each administrator be added as a user on an LDAP server, and their LDAP credentials mapped to Couchbase Server. Additionally, it requires that the saslauthd library, which handles authentication-requests on behalf of Couchbase Server, be configured to handle LDAP authentication. LDAP authentication is currently available only for the Enterprise Edition of Couchbase Server, and only on the Linux platform. Note also that mixed-version clusters do not support LDAP authentication: therefore, to use LDAP authentication with a given cluster, upgrade all cluster-nodes to the latest version of Enterprise Edition Couchbase Server. Couchbase Server is designed to interoperate with OpenLDAP software, which can be downloaded from the openldap.org website. Centralized identity management. Multiple administrators can be defined, each with either read-only or full, read-write permissions. Centralized security policy-management. All administrative accounts can be consistently protected: for example, through the enforcement of password strength-levels, password-rotation, and auto-lockout. Simplified compliance. The activities of each administrator can be identified, tracked, and comprehensively audited. As the illustration shows, the administrator enters a username and password at the login prompt provided by Couchbase Web Console. This is checked against a local admin password file. 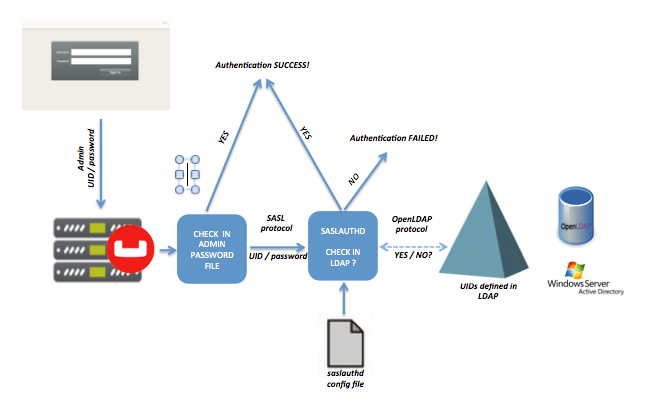 If the saslauthd library has been configured for LDAP, the credentials are then checked against an LDAP directory service: if the credentials are validated, authentication succeeds. For details on configuring the saslauthd library, see Configure saslauthd.